USS Spiegel Grove – Top Dog! 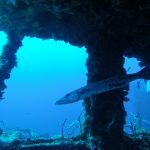 The Spiegel Grove is one of our most requested dives sites and on many divers bucket lists. At 510 feet long this is a very large wreck. Sunk in 2002 as an artificial reef she led on her side for 3 years and was righted by hurricane Dennis in 2005, this is a spectacular wreck! The Spiegel Grove lies in 130 feet of water with the deck at around 65 feet. With 7 mooring balls on this wreck there are many ways in which to dive her. Our favorite is amidships moorings as these offer the most varied options for dive routes at the shallower depths. There is much to see and some really nice swim through and companion way routes. Divers often like to stop and have photographs and video by the flag on the Primary Flight control. There are many entry and exit points into the wreck that can be explored and our dive guides are happy to show you around. 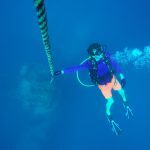 What dive certification do you need? Divers will need to be certified to Advanced Open Water to be able to dive this wreck. If you do not have this certification we can teach you the course in 2 days and you get to dive the Spiegel Grove in the process! We recommend divers use NITROX for this dive. The Spiegel Grove is often affected by current but you should always be able to get a great dive if you keep low to the deck and get shelter from the current by the ships superstructure. There is always plenty see and something different on every dive, we have customers that have over 200 divers on her and still want to dive her some more. Additional equipment for these dives are flashlights and gloves. Gloves are important as the downlines to the wreck can have sharp objects on them. We offer single or double dip dives on the Spiegel Grove. We require divers use NITROX to double dip the Spiegel Grove. 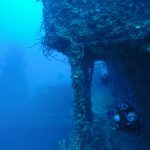 If you would like just a single dive then a great second dive is the Benwood, which is a natural wreck sunk during a collision in 1943.